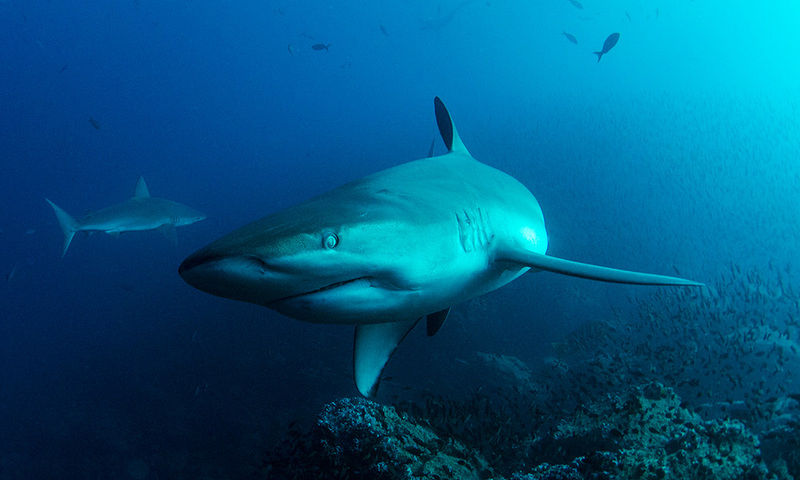 Despite its name, the Galapagos shark is not endemic to the Galapagos Marine Reserve, but it is a common sighting at many dive sites in Galapagos. The Galapagos shark is a species of requiem shark – a family of migratory, live-bearing sharks found in warm waters. Despite its name, the Galapagos shark is found all over the world, but it was first discovered in what is now the Galapagos Marine Reserve. They are quite large for their genus, and have the stereotypically slender, streamlined shark-shaped body. They have 14 rows of serrated teeth that are triangular on the top and sharper on the bottom. Galapagos sharks closely resemble reef sharks and dusky sharks, making them difficult to identify in the field. However their skeletons are very different – the Galapagos shark has 58 vertebrae, whereas dusky sharks have 86-97 vertebrae, and grey reef sharks have 110-119 vertebrae. Galapagos sharks eat primarily benthic bony fish, but in Galapagos they also predate fur seals and sea lions. They have also been known to be cannibalistic, therefore young shark pups tend to stay in shallow inland waters, away from groups of adults. Adult Galapagos sharks are very inquisitive, often showing aggression towards fishermen who try to scare them away. Once they become excited, they are difficult to deter, and when they go into a frenzy they may attack anything floating on the surface of the water. Conversely, they often feel threatened in the presence of divers and some other species of shark, taking on a hunched position. Where to see them: They are found at depths of around 100m in worldwide tropical oceans. In Galapagos, they are particularly seen in the waters off of Wolf and Darwin islands. When to see them: They tend to be seen throughout the year around the Galapagos Islands as the water there is ideal for them. Their mating season is between January and March, so for about a month after March juvenile sharks may be seen in the shallow waters along the coastline. Threats: Adult Galapagos sharks are too large to be eaten by most predators in their geographical range, therefore humans are the major threat to their population. Local fishing depletes numbers through bycatch, and populations tend to recover slowly due to their slow reproductive rate. They may also be purposefully caught in some areas, with their fins being used to make shark fin soup, and their oil, teeth, and bones used in traditional medicines and jewellery. Conservation action: In some locations around the world, the Galapagos shark is a targeted commercial species and in some locations it is thought to have gone locally extinct. Shark fishing inside the Galapagos Marine Reserve is outlawed, however illegal long-line fishing does still occur. They are not currently listed on any CITES appendices. Help us to protect the Galapagos shark today by donating to our Endangered Sharks of Galapagos programme! 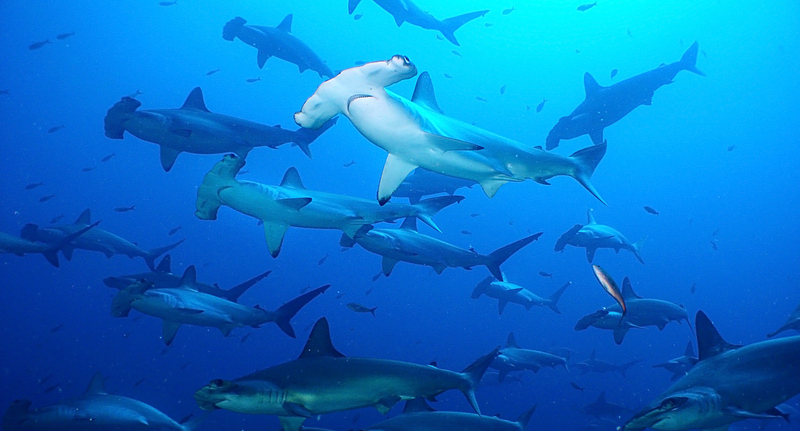 Learn more about the sharks of the Galapagos Marine Reserve.